Hello! 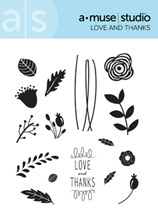 I am so excited to share with you a new stamp set I just received from A Muse Studio called Love and Thanks! I love the many variations I could create using this set. Hello! This is a really simple card. I decided where my flowers were going to be placed then stamped them. I then used the Landscape die set for the hill and placed it right on top of the stem portion. 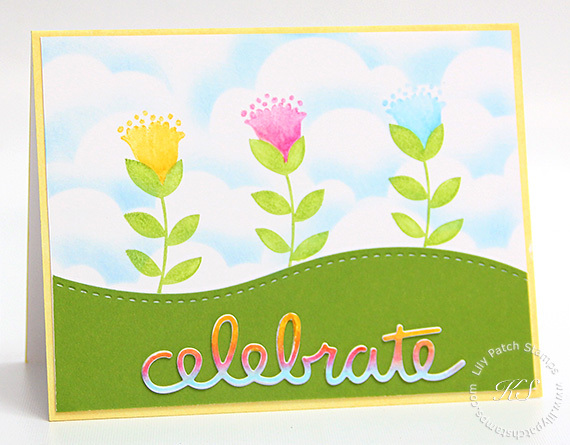 The sentiment was die cut twice and I used Tombow Dual Brush Markers to color them in then using the blender marker to blend the three colors together. The clouds were added in after I put the card together. I didn't like the white background so I took the landscape die and used it to create the clouds. This is just so very beautiful. Nice work. A beautiful card. I love how you used the stamps. Thank you for participating in Jo's Fun Friday Challenge. Love your background of clouds and all the pretty colors in your scene. The sentiment looks cool picking up the same colors. Thanks for sharing at Aud Sentiments. What a beautiful scene you've created! LOVE the sentiment! Thanks for joining us at Kraftin' Kimmie challenges! Good luck!